I have been looking for the perfect lace top for so long, and I finally got my hands on one. 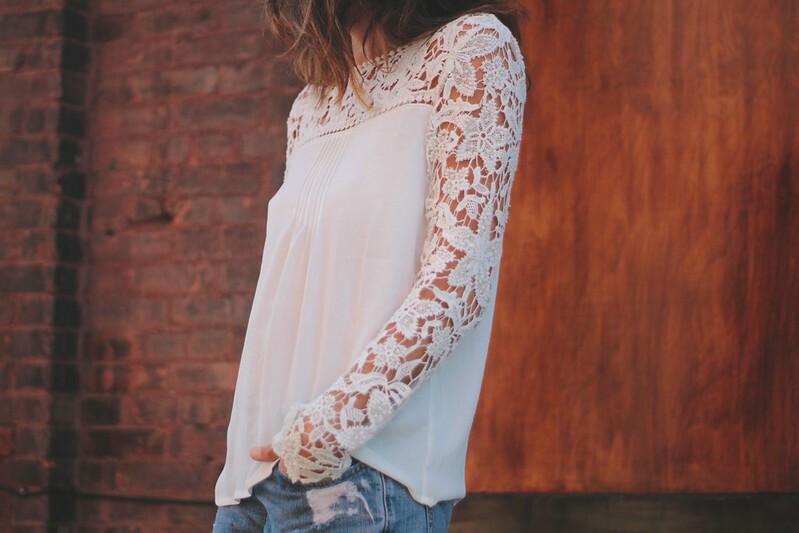 The amount of lace on this top is just right and it looks so freakin' good with distressed denim. If you're looking to achieve an effortless look, lace has to be dressed down or edged up. I did something very similar in this recent post. We've had a bit of a heat wave in NY, perfect long sleeve and bare leg weather. Once the colder months roll around I will definitely be edging this up with some black leather. This entry was posted on Wednesday, October 16, 2013 and is filed under blue,choies,denim,lace,white. You can follow any responses to this entry through the RSS 2.0. You can leave a response. Perfection. The boots and cutoffs edge up the lace just right. Sheree the lace top IS perfect, you're right!! I love the contrast of pretty lace with the distressed denim. A beautiful combo, sweetie - you look as uber stylish as ever...! another stunner sheree! the boots are fab! Love the lace with the cutoff shorts. Chic yet casual. Love it. This top is everything! And your shoes, those shoes are amazing! So stoked to see this post in the Seasonal Series linkup! I cannot agree with you more about lace and it works really well with fall. Gorgeous top! love the grungy + feminine touch! I love the top with the lace detail. I really like the backpack. Such a beautiful combination of delicate and rough. The lace top is beyond pretty and very boho chic! It is the perfect amount of lace - distinct from a lot of what is out there and too generic. Gorgeous, and you styled it fabulously.